When his number was called, Kenrich Williams answered the bell. An injury-plagued New Orleans Pelicans lineup has allowed the former TCU men’s basketball forward to see quality minutes for the first time in his young career, and he’s made the most of his opportunity. The Pelicans are currently missing four of their five regular starters, allowing Williams to record a team-high 37 minutes in Wednesday, Jan. 30 loss to the Denver Nuggets. Williams has averaged 23 minutes in each of his last four games, 10 more than his career-high in minutes before Jan. 24. 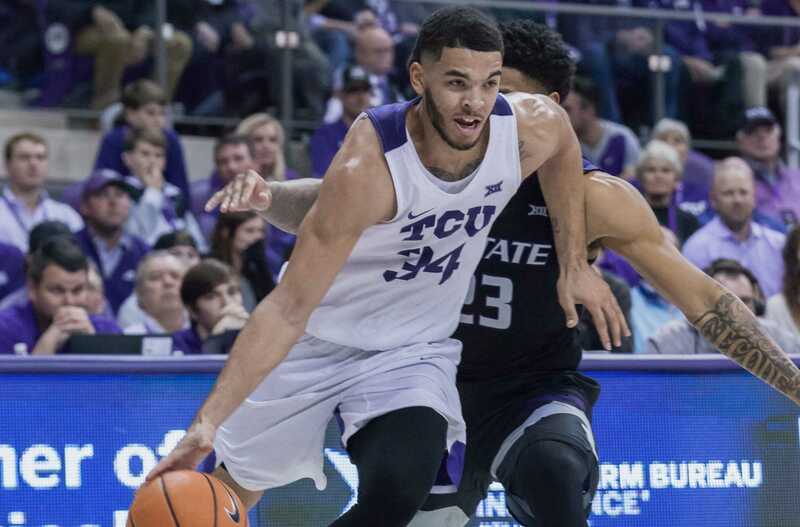 TCU fans saw a familiar version of Williams in which he attacked the boards and made his presence felt on the defensive end. Williams grabbed a career-high 16 rebounds in Tuesday’s upset victory over the Rockets in Houston and scored a career-high 21 points on over 50 percent shooting from beyond the arc Wednesday night. Williams transferred to TCU from New Mexico Junior College after not receiving any Division 1 offers out of high school and overcame multiple knee injuries before starting in all but one game during his junior and senior seasons. Kenrich Williams drives to the rim against Kansas State on Senior Night. Photo by Cristian ArguetaSoto. However, Williams had an unconventional path to the league and a spot on a professional roster was never guaranteed. His coaches thought he was in a good position heading into the NBA Draft until red flags appeared during a pre-draft physical. “So now he’s got to battle himself again and make decisions and make choices and take a two-way contract and stick with believing in himself,” TCU head coach Jamie Dixon said. Williams now sits alone as the only free agent in the league on a full contract. Dixon said Williams’ success will only help the program in the future. “You recruit kids and tell them you’re going to make them better, and there’s no better story than an unrecruited high school kid becoming an NBA player and developing him as he’s here,” Dixon said. Williams and the Pelicans will return to the hardwood at 7:30 p.m. on Saturday against the Spurs in San Antonio.